In many installations security integration companies are putting IP cameras onto separate or parallel networks. In these cases, the installing firm would normally supply network switches to provide connectivity for IP cameras, access control devices, and other security equipment. By putting the security devices on isolated separate cabling and network switches, the security of the system is “hardened” as internal employees who are not allowed onto the security network cannot easily access the security devices. Using separate network switches with PoE power can lower costs of cabling while provide a dedicated power source for remote cameras and devices that can use PoE. If a security dealer is planning to install a parallel network, it is vital to select the proper network switch or switches to provide LAN connectivity for the security equipment. Choosing the wrong switch can result in poorly or non-functioning security devices. There are two basic categories of network switches; managed and unmanaged. Managed network switches have various capabilities for network operators to contour how the switch interacts with devices on the network and their data streams. These high-end switches are typically found in large IT networks at locations such as universities, factories, large offices and on other “enterprise-level” networks. Unmanaged switches are typically found in residential and light commercial networks. Unmanaged switches come factory pre-set with a group of functions intended to work well with most common IP devices including IP cameras. When using unmanaged switches, users have no options for changing the switch’s functions. At first glance, it may appear that IP surveillance camera installations need the added features of managed switches. However, in most applications unmanaged switches have abundant capabilities to handle multiple IP video streams. When it comes to the specifications for network switches to be used for IP cameras, there are three performance values that need to be verified. First, there needs to be an adequate number of switch ports to connect the number of IP cameras and devices being used in that portion of the installation. 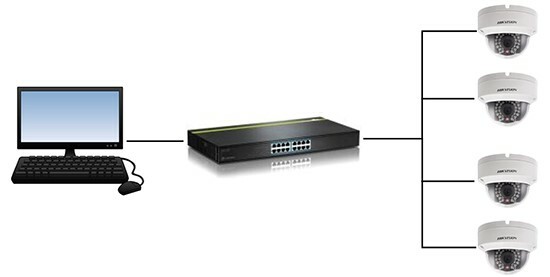 It’s important to remember that if the switch is to be connected to another switch or a router one of the switch ports must be used for this connection. So a sixteen port switch may be limited to connecting only fifteen field IP devices. The second issue is the switch fabric, which is a value that indicates how much data a particular switch can process in a one-second time period. Take for example, a switch that has a fabric value of 3.2 Gbps. If we plan to install 15 IP cameras each streaming 3 Mbps of video data, the aggregate of the data to be processed is 45 Mbps of video, which is well within this switch’s capabilities. If the plan is for this selected switch to be connected to another switch or a router, the third concern is whether the switch has adequate ports that are capable of passing the aggregate video bandwidth from one switch to the next. If the installation utilizes fifteen cameras that are putting out a total of 45 Mbps of video, the switch being used needs to be able to transmit the required bandwidth. Many switches have distinct “uplink” ports that can typically transmit Gigabit Ethernet, which will provide the largest bandwidth “pipe” between two network switches. The other variable that must be considered is that the cabling and connectors between this switch and the next device needs to be selected, installed and tested to industry standards. Smart security dealers will use any previously installed fiber optic links as these have massive bandwidth capabilities provided that the fiber links are properly installed and terminated. In a situation where no fiber is available, Cat 6 cable should be used to connect from switch to switch, and/or switch to router. And remember to use Cat 6 grade RJ-45 jacks with the Cat6 network backbone cables. The ADI system support group is always available during business hours to assist you in product selection, with specialists who have been thoroughly trained in their system and product specialties.